Car yard vehicle finance can really take the shine off a new car. So, don’t let the new car smell make you do something rash. There are plenty of car finance options to consider, not just to the dealer finance offered by the salesperson. Whether it’s a new car or it’s new-to-you, it can be easy to get carried away and sign up for the finance offered by the car yard. 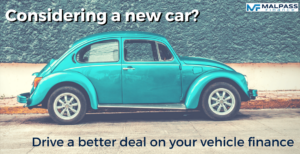 Often there are better deals available elsewhere and by being prepared with your preapproved finance you can get the wheels you want for less. Let’s have a chat and see what deals are available and suitable for you to upgrade your transport without being taken for a ride. Call me on 0431 8621 36 or send me a facebook message when you’re ready.